The SeceuroFire range currently offers the Flame Curtain and Flame Shutter that also doubles up as a security solution. The SeceuroFire is an automatic Flame Curtain that has a 2 hour rating and is the perfect solution where protection is required but without compromising on the aesthetics of a building. Both the Flame Curtain and the Flame Shutter have been tested and assessed by Exova Warringtonfire. 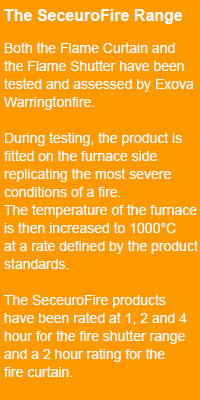 During testing, the product is fitted on the furnace side replicating the most severe conditions of a fire. The temperature of the furnace is then increased to 1000°C at a rate defined by the product standards. The SeceuroFire Flame Curtain is an automatic flame curtain made of heavy-duty fibreglass designed to fit over passageways, doors and windows to prevent the spread of fire. They only operate in the event of a fire and can provide up to 2 hours of containment when deployed. As they are made of fabric they still provide a route of escape when necessary by lifting up to create a gap large enough to escape through. Flame shutters are similar to conventional steel slatted and galvanised steel roller shutters that operate vertically, closing in the event of a fire. Our fire shutters are available in safety ratings of up to 4 hours. One of the main benefits of Flame shutters is there ability to act as a means of physical security during normal use and a fire safety shutter in the event of a fire. All SeceuroFire products are guaranteed against defect of material or workmanship by SWS UK, subject to correct installation, maintenance and operation, for a period of 12 months from the date of purchase.